Requiem For a Laughing Gnome. لسلام عليكم. Of the four movements of “Requiem for a Laughing Gnome” (DRJ 405u), only the first is extant in performance, although incomplete. The performance fragment exists in poor quality from an analog vid-aud broadcast (see “television”) of what 20-21C cultural theoreticians have posited to be a public debasement video for “celebrities” who had fallen out of favor with the state. The composition for recorder, voice and footfall starts intriguingly, but unfortunately the development section is curtailed when the vid-aud is cut off. The second movement exists in fragmented manuscript form, a piece of letterstock retrieved during the first excavation of the British Museum after Continental Flood 2. It was part of a collection of manuscripts badly deteriorated by water and soil. A minority of 20-21C CTs claim this is not DRJ 405u at all but a receipt for some sort of financial transaction (see “money”) entailing an exchange for food; a prevailing majority argue that the arrangement of numbers and key-symbols correlate with B’Wie’s music of the first movement, suggesting that the 2nd movement began as a rhythmic variation of the initial melody. Of the third movement, nothing is known. During one re-ignition operation of the World Web, conducted in New Mombasa (AGC2 34), a fragment from a “message board” was retrieved, its author making what may have been a reference to the movement: “Gnostic.” This is very speculative. The last movement is also unknown but according to folk legends compiled in the century after the Second Global Calamity, it was a favorite melody of King George 7 in his exile. First movement fragment recorded during “Comic Relief” 24 Zulqada 1419 (12 March 1999 Georgian) (56 BGC1). Top: B’Wie, photostill before sainthood ca. 56 BGC1. This entry was posted on Monday, October 14th, 2013 at 12:58 pm and is filed under BMG-Virgin Years: 1995-1999. You can follow any responses to this entry through the RSS 2.0 feed. Both comments and pings are currently closed. Just poking fun. I’ve enjoyed the ‘detritus’ entries, this one in particular, actually. I haven’t really come around on hours, though I really enjoyed his live “Seven” from the Beeb disc. I’m looking forward to your take on that one. I have no idea what he’s singing about on that, but love his “gods forgot that made me, well, I forgot them, too” line. I like a few of the songs on hours, but overall I remain disappointed. I have, however, been greatly looking forward to reading about it here. I must be the only person in the world who really enjoys …hours. I really love “hours” and looking forward for a PAotD treatment of it. I absolutely love this skit, even if it involves Bowie doing terrible things to an instrument I used to be able to play well enough I could play stuff by Haydn or Vivaldi. It’s funny though. Charming. You gotta give him that. I guess I’m alone in feeling that “Hours” was compelling listening. I’d felt that Bowie’s reliance on generative Eno/Burroughs systems to create his music had left him high and dry with diminishing returns and the return to Hunky Dory-esque songcraft was greatly appreciated by me at the time. I liked “Hours” so much that it finally spurred me on to buy “Let’s Dance,” “Tonight”, and “Never Let Me Down” after years of avoiding them like the plague. Now, touches like the sample/loop-based music construction of “Thursday’s Child” just rankle me. Will I ever be pleased? Not alone. It was one of the first of his albums I bought (the 2nd one after Heathen) and I have a special connection to it. Especially to Seven. For some reason I was able to connect to this album better on a personal level than to Heathen, even if I consider Heathen to be a superior album. I don’t dislike any track on Hours, which is something I can’t erm, actually say about many Bowie albums, including the classics. That should count for something. No, you’re not alone. I like it too. I feel it starts off very strongly with Thursday’s Child, then kind of meanders for a while with three fairly dull and overly long tracks in Something In the Air, Survive, and If I’m Dreaming My Life. From Seven onwards though, it hits the ground running again and is pretty enjoyable right to the end. The glam-referencing The Pretty Things Are Going To Hell should have been a cracking-ly successful single. Of course, some of the critical reaction to it at the time was pretty annoying to me. After dissing Bowie for being a grandad trying too hard to keep up with current trends on Outside and Earthling, the NME and other publications now criticised him for returning to a more classical song-writing style. Perhaps it raised expectations too high when the pre-release hype coming out of the Bowie camp at the time suggested that the album would be similar to Hunky Dory, or something to that effect. But if Bowie was anywhere near as thin-skinned as I am, he must have wondered what he had to do to win the critics over again when faced with the reviews. I must admit that my introduction to Pitchfork was their Hours review, and it really hit the nail on the head for me at the time. My opinion on the album has since softened, and even if it hadn’t my expectations for Bowie the Human Being are now much less demanding, but PF’s indignant tone really gave a voice to my shock and profound disappointment upon first hearing Hours. I had really dug Outside and Earthling, and totally did not see this development coming. I guess that’s part and parcel of being a Bowie fan though. Always with the surprise twists! I always thought it was a real shame that Bowie didn’t give in to the NME’s campaign to have him perform “The Laughing Gnome” live. You had a ball writing this one, didn’t you? And thanks as always Chris, for keeping up with the proper gnomenclature in your write-ups. 2. It’s impossible to get any further here without recourse to Martin Heidegger’s concept of Nasein. The phrase is properly speaking untranslatable; the closest I can come is “nasal non-being”, but of course that doesn’t do justice to the subtle semantic inflexions, which also bring pickled horseradish inexorably to mind for German-speakers from the Westphalian plains. 4. I detect a clear reference to the Bowie Bonds in the Requiem; “Call this number or I’ll continue an avant-garde performance indefinitely” is a not-so-thinly-veiled request for investors to pour money into Bowie’s commercial material, with the alternative being starkly laid out: unlistenable self-indulgence without bound or limit. 5. I believe Bowie is “short-selling” himself here, just as he did when he allowed selections from Side 2 of Low to be used in the Blue Jean film to establish Screaming Lord Byron’s pretentiousness. For there are those of us — true avant-Bowie fans — who would have warmly welcomed a 7-hour footstomping and avant-garde recorder performance with transient announcements of sexual positions for Sooty, vastly preferring it to what we got: the Hours album. 7. There is also, I believe, a strong Yoko Ono reference here. When she first arrived in New York, Ono quickly discovered the power of prolonged strident ululation when neighbours banged on the door of her Chambers Street loft asking her to “cut it out” (the inspiration, as it happens, for her Cut Piece). Ono agreed to stop screeching in return for donations to the Small Panthers; it was in this way that the dwarf activist group received its most significant funding. 8. Finally, mention must be made of Episode 13 of Tony Newley’s Strange World of Gurney Slade TV series. In the episode Newley wandered through London dressed as an elf in knickerbockers (later replaced by creaky lederhosen), playing a recorder and discovering that “you don’t have to be big to wind people up”. The episode was 13 hours long and was broadcast — as fate would have it — on the day of the Kennedy assassination. Completely eclipsed by coverage of the tragedy in Dallas, the show had only one viewer, probably Bowie himself. How else to explain that lyrics for The Laughing Gnome repeat word-for-word the script of this episode, now sadly erased? 9. There are other influences: material cut from the Ricochet documentary shows Bowie witnessing a Hmong ritual of “denecking”: when the metal braces worn by Hmong women around their necks are removed, their bodies truncate to a fraction of their former size. The flute music accompanying denecking sounds very much like the recorder music in Requiem. 10. It is significant that Requiem for a Laughing Gnome remains unfinished and unperformed: an unfinished — and therefore unperformable — requiem represents a hope for immortality. Except, of course, when the reason for non-completion is death itself: Mozart’s Requiem Mass in D minor, for example, was interrupted by the composer’s own death. Fortunately our hero survived the composition of Requiem for a Laughing Gnome, largely because its improvised nature allowed Bowie to avoid much or all of the exhausting preparatory and compositional effort that killed Mozart. 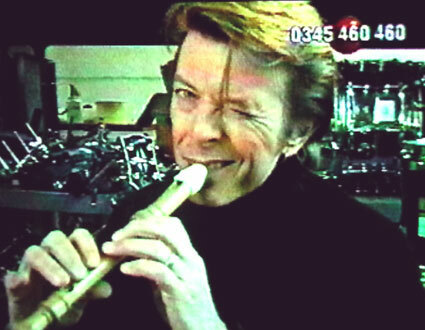 As an act of sheer perversity (and time wasting) took the recorder part from Bowie’s Requiem for the Laughing Gnome and applied some granular treatments and what have you, simmered for an hour and voila…. Thanks – it came out better than expected what with the random nature of the recorder playing or maybe that helped? Very nice! I’ll take that over “Brilliant Adventure” any day.